North Lima Mennonite Church in North Lima, Ohio on 11 August 1952. Source: Mennonite Community Photograph Collection, The Congregation (HM4-134 Box 5 Folder 1 photo 010.4-4). The North Lima Mennonite Church (Mennonite Church USA), formerly known as Metzler's, in North Lima, Mahoning County, Ohio, is a member of the Ohio Conference of Mennonite Church USA. The Mennonite community in Mahoning and Columbiana counties began in 1806 or earlier, one of the oldest Mennonite settlements in Ohio. Jacob Oberholtzer was living there by that year and was the first preacher, organizing soon after arrival the first congregation at what is now called Midway. In 1817 Jacob Nold, a bishop from Bucks County, arrived and located near Leetonia, where a meetinghouse was erected in 1819. The settlement near North Lima was begun in 1821. 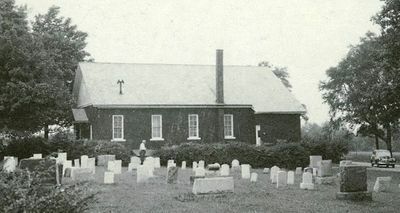 The first meetinghouse at the present site (Metzler's Church) is thought to have been built about 1824 by a group of families either related to the Metzlers or bearing the name; David Metzler, a deacon, who had come from Lancaster County, Pennsylvania, about 1821, donated the land. Until 1948 the North Lima, Midway, and Leetonia congregations functioned largely as one organization, rotating services (except Leetonia after ca. 1915), the membership being served in a circuit by the total ministry. A. J. Steiner, ordained bishop in 1910, was the last circuit bishop, retiring about 1950, when his son David C. Steiner was ordained (1952) as bishop for North Lima alone. The 1956 membership was 116. In 1872 a division occurred in the district, the Old Order or Wisler group withdrawing to form the Pleasant View congregation, which used the three meetinghouses jointly with the regular Mennonite congregation until 1898, when it built its own meetinghouse. In 2016 the North Lima Mennonite Church left the Ohio Conference and joined the Lancaster Mennonite Conference. This move was part of a larger realignment of Mennonite congregations formerly part of Mennonite Church USA. These congregations were unhappy with Mennonite Church USA's failure to take stronger disciplinary actions against area conferences and congregations who expressed openness to inclusion of lesbian, gay, bisexual and transgender persons. The Lancaster Mennonite Conference took action in 2015 to withdraw from Mennonite Church USA by the end of 2017, and became an attractive alternative for these congregations. Steiner, James A. "Mahoning and Columbiana County Mennonite Churches." Ohio Evangel 10 (September-October 1956): 2-4. Steiner, James A and Sam Steiner. "North Lima Mennonite Church (North Lima, Ohio, USA)." Global Anabaptist Mennonite Encyclopedia Online. 1957. Web. 22 Apr 2019. http://gameo.org/index.php?title=North_Lima_Mennonite_Church_(North_Lima,_Ohio,_USA)&oldid=161054. Steiner, James A and Sam Steiner. (1957). North Lima Mennonite Church (North Lima, Ohio, USA). Global Anabaptist Mennonite Encyclopedia Online. Retrieved 22 April 2019, from http://gameo.org/index.php?title=North_Lima_Mennonite_Church_(North_Lima,_Ohio,_USA)&oldid=161054. Adapted by permission of Herald Press, Harrisonburg, Virginia, from Mennonite Encyclopedia, Vol. 3, p. 921. All rights reserved. This page was last modified on 6 July 2018, at 13:41.